Megan Anderson hasn’t been notified that she’s a backup for the UFC 232 co-main event but she hates the narrative that Amanda Nunes is somehow a risk after pulling out of one fight. 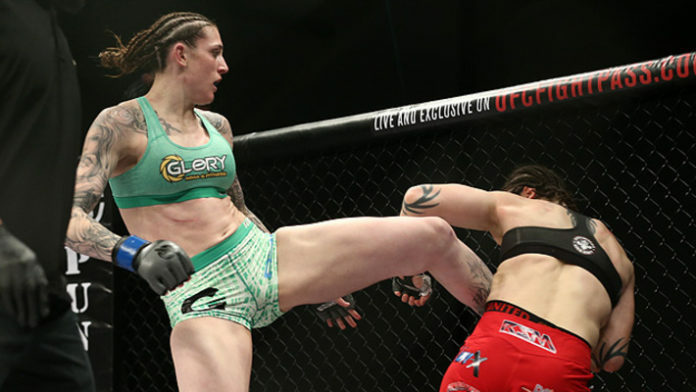 Megan Anderson is ready for whatever gets thrown her way at UFC 232 — including a short notice title fight — but she’s only worried about Cat Zingano. In the lead up to the show on Saturday night in Los Angeles, a lot has been made about Anderson’s fight against Zingano serving as a backup to the co-main event where women’s featherweight champion Cris Cyborg faces off with women’s bantamweight champion Amanda Nunes. Cyborg was rather vocal about the UFC getting a backup fight in place just in case Nunes was unable to compete because she didn’t want to go through an entire training camp only to miss out on fighting at the last minute. Part of the reason for that request stems from Nunes pulling out of UFC 213 after she ended up in the hospital dealing with severe bout of sinusitis that forced her out of her scheduled fight against Valentina Shevchenko. After that happened, UFC president Dana White was very angry about Nunes not being able to compete while repeatedly stating that she had been cleared to fight by the physician. Anderson and Zingano were then added to UFC 232 presumably in the backup role that Cyborg had requested just in case somebody wasn’t able to fight in the co-main event. For her part, Anderson says nobody has told her that she’s going to be the backup for the fight but she also hates that a narrative has been built up that Nunes is somehow unreliable because she had one incident where she was forced to pull out of a fight. “We haven’t been notified if this is the backup fight or not and I really don’t care,” Anderson said ahead of UFC 232. “The thing that kind of annoys me with this whole scenario is everyone is making such a big deal about Amanda missing her fight before. What about Max [Holloway]? I love Max Holloway, he is legitimately one of my favorite fighters to watch but his last two fights he was supposed [Brian] Ortega and he was supposed to fight Khabib [Nurmagomedov] and he was pulled just two days before the event. No one is talking about that. No one is making a big deal like they are with Amanda. While she’s willing to accept whatever fight is thrown at her, Anderson is only thinking about Zingano and not spending any extra time worrying about Cyborg or Nunes on the off chance one of them is unable to compete. In fact, Anderson is quite confident that Cyborg will face Nunes on Saturday night and she’ll just get the opportunity to enjoy the champion versus champion showdown as a spectator after her fight against Zingano is finished. “I don’t think either lady is going to pull out,” Anderson said. “I know Cris wants that fight, I know Amanda wants that fight. I’m going to try to make championship weight anyway but my focus is on Cat. If some s—t happens, they break a leg, or whatever happens we’ll step in but I think the focus really should be on Cat.